Get a customized skate bag. It doesn't have to be a 'Zuca' or anything too expensive, as long as it's clearly a bag meant for holding skates, rather than just a backpack or other bag. Use skate hard guards for walking around and soft guards for when they are in your bag. These will prevent your blades from being damaged on non-ice surfaces. Whenever you're walking around the rink and not on the ice, put on the guards. Wear flesh-colored tights, rather than colored ones. If the package says that the tights are made for skating, then these will likely be flesh-colored but ask the retailer for advice if you're unsure. Do not wear long skirts. Anything below your knee makes it harder to move, and does not fit the figure skater image. Any skirt longer than 18" is just too long and if you are spinning you can't see your feet. 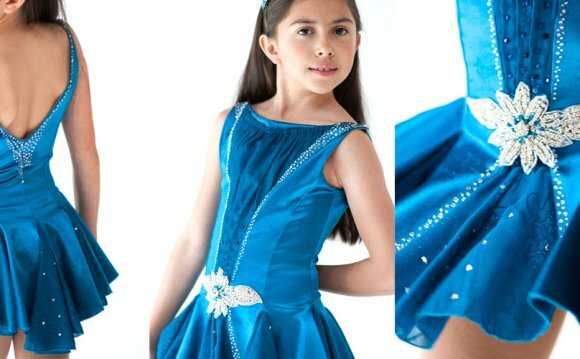 Anything very expensive, fancy, or detailed is not a good practice dress. Don't wear jeans. They are usually stiffer than normal pants, and the material will stay wet instead of drying when you fall. Dress comfortably. If your outfit is uncomfortable, it'll be harder to concentrate and skate well. Get white skates. You can buy them or rent them, it doesn't matter, but anything else in a different color does not work with the theme. Wear gloves. You'll be warmer, and most figure skaters do while practicing. Wear your hair up. The most common hairstyle is a ponytail. Know how to use and hold your arms correctly while skating. Learn how to skate backwards as well as forwards. Learn how to do lunges. These are fairly straightforward to do and will gain you many compliments once you've perfected them. Practice what you need to do. It's okay to show off something you're good at once in a while, but you need to practice to become better. Consider bringing a water bottle, room temperature water is better than ice cold water and put it on the side of the boards. It's convenient if you're thirsty, and many well-known figure skaters do this. Remember to look up and bend your knees. Be confident. No matter what level you are, having confidence will help you to succeed in your learning and improving. Don't let the whole idea of appearance get to your head. Stay down to earth and modest about skating, no matter how good you are. And concentrate on always improving––the proof is in your ability, not your appearance.